We have become accustomed to associate diseases of the nervous system with a latter stage in life and we almost feel at ease to realize we still have the advantage of age on our side. Yet multiple Sclerosis is a terrible disease that contradicts this view. 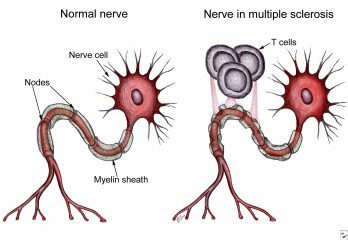 Multiple sclerosis is one of the main disabling diseases in young adults. It is a demyelinating disease that can be extended to the entire nervous system. Its causes are still unknown. The onset of multiple sclerosis usually registers between 20 and 40 years old, with a latency period of 10-20 years. Its frequency is higher among women. Recently, the Atlas of MS 2013 issued by the Multiple Sclerosis International Federation has shown that the number of people living with multiple sclerosis worldwide has increased by 10% in the past five years, to 2.3 million. According to a survey, multiple sclerosis is most common in North America and Europe, with 140 and 108 cases per 100,000 individuals respectively, while in sub-Saharan Africa the rate is just 2.1 per 100,000. The findings have also confirmed that this disease occurs significantly more in countries located at high latitudes, with Sweden having the highest rate in Europe and Argentina having more cases than other countries further north. Although both the brain and the spinal cord look macroscopically normal in patients with multiple sclerosis, a segment analysis reveals called plaques in certain areas, determined by the demyelination process. At the moment, there is no full treatment or cure for this disease, but medication can keep it under control and alleviate symptoms. An anti-inflammatory treatment is the most common form of treatment, to which specialists may add a symptomatic type of treatment to fight crises. Recently, famous Harry Potter author JK Rowling has donated £ 10 million for the development of a multiple sclerosis research center at Edinburgh University. The facility has been named after her mother, Anne Rowling, whom she lost due to this disease at the age of 45. The purpose of the center is to research new ways for the treatment of neuro-degenerative diseases and completely cure the damage it causes done in patients. Multiple sclerosis is a debilitating disease that stigmatizes young people, but correct and early treatment can relieve the suffering of these patients.